1SRMC Centre for Indian Systems of Medicine, Quality assurance and Standardization, Central Research Facility, Sri Ramachandra University, Porur, Chennai, Tamil Nadu, INDIA. 2Department of Pharmacognosy, Faculty of Pharmacy, Sri Ramachandra University, Porur, Chennai, Tamil Nadu, INDIA. 3Central Research Facility, Sri Ramachandra University, Porur, Chennai, Tamil Nadu, INDIA. Background: Murraya koenigii, commonly known as “curry leaves” is native to India. The highly valued part of the plant is the leaves which possess various biological activities. Objective: The present study aimed to investigate the antidiabetic effect of Murraya koenigii (MK) leaf extracts, of two different solvent ratios. Materials and methods: 70% hydroalcoholic and alkaloidal extracts of MK leaves were prepared by cold maceration method. Preliminary phytochemical analysis was carried out for both the extracts. In vitro anti diabetic activity was screened by inhibitory action on α – amylase, α – glucosidase enzymes. Further, the 70% hydroalcoholic and alkaloidal extracts were assessed for glucose uptake potential, anti - adipogenic property, as well as inhibitory activity on diabetes associated complications. HPTLC quantification of major phytoconstituent was carried out. Results: The study showed presence of various phytoconstituents such as, polyphenols, alkaloids, tannins, reducing sugars etc. The 70% hydroalcoholic and alkaloidal extracts of MK leaves exhibited >90% inhibition against carbohydrate metabolising enzymes compared to aqueous and absolute alcohol extracts. Both the extracts showed enhanced glucose uptake in L6 myotubes attenuating the effect of Palmitate induced insulin resistance. Significant inhibition on adipogenesis was exerted by both 70% hydroalcoholic and alkaloidal extracts of MK leaves. Besides, marked inhibition of advanced glycation end products was exhibited by the extracts. 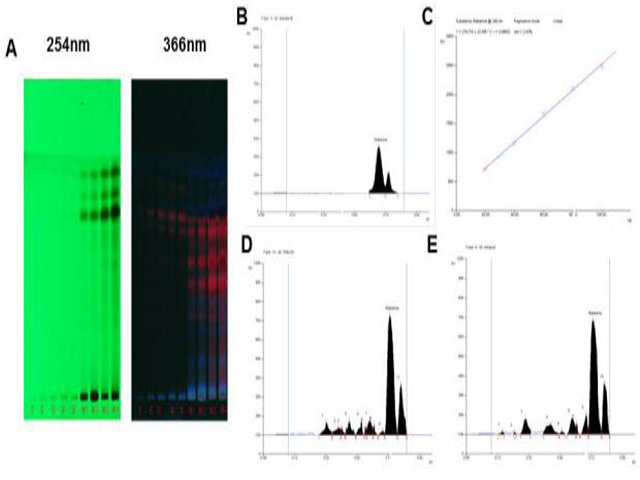 HPTLC quantification analysis of the aforementioned extracts showed the presence of major phytoconstituent, Mahanine, in it. Conclusion: The results of the present study showed that MK possesses significant antidiabetic property and also exhibited considerable effect in preventing diabetes associated complications. The potent antidiabetic activity of MK could be attributed to the presence of Mahanine, the major active constituent, which is a carbazole alkaloid. Parthasarathy PR, Murthy J, Girija DM, Telapolu S, Duraipandian C, Panchatcharam TS. Hydroalcoholic and Alkaloidal Extracts of Murraya koenigii(L.) Spreng Augments Glucose Uptake Potential against Insulin Resistance Condition in L6 Myotubes and Inhibits Adipogenesis in 3T3L1 Adipocytes. Pharmacognosy Journal. 2018;10(4):633-639.